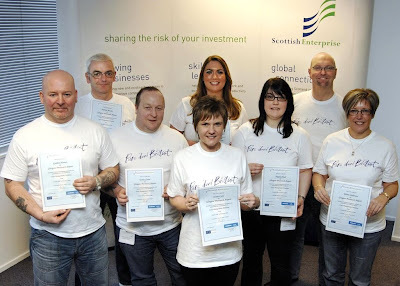 EIGHT Glasgow Prestwick Airport employees have graduated from the Lean Management Programme, run by Accelerate, a company who specialises in streamlining companies and organisations to make them more ‘lean’. In the run up to busy Easter and summer holidays, the programme will help make processes more efficient for the operational and supervisory employees at the Airport. 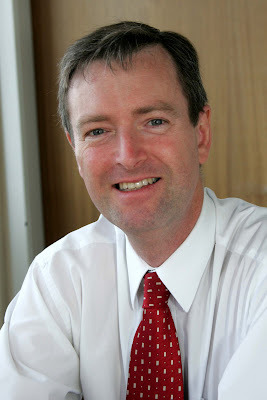 The airport’s participation in the course, which lasted for six months, was driven by chief executive Mark Rodwell (pictured above) and it aims to improve the efficiency of current recruitment processes within the airport. In 2007, there was a 15% staff turnover and it was taking in some cases up to 45 weeks to complete the recruitment process, partly due to security measures and checks put in place and applying to Disclosure Scotland, for vetting and barring of candidates. Since the Lean Management programme has been completed, the team is now working on the completion of the website, which will feature a Careers section. This feature will allow candidates to view different career paths available at the Airport, apply for jobs, as well as help to speed up the recruitment process by applying earlier to Disclosure Scotland, prior to attending any interviews. Glasgow Prestwick Airport human resources manager Sonia Rafferty said: “We decided it was a good idea to get involved in the Lean Management programme as we were reviewing our recruitment process and feel that taking part will help us not only to recruit the best person for the job, but also that the recruitment process will take considerably less time than it does at the moment. By introducing lean practices and procedures in 2009, Glasgow Prestwick Airport will save nearly £30,000 through a reduction in paper waste, overtime, sickness and agency fees and switching to a CD Rom handbook, and has already cut down its carbon footprint as a result of reduced paperwork. Glasgow Prestwick Airport was Scotland’s fastest-growing airport from 2000–2005 and offers low cost scheduled flights to more than 30 European destinations. In 2007 the airport handled 2.4 million passengers.